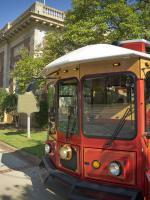 After 30 years the Milledgeville CVB is saying goodbye and thank you to the heart and soul of the trolley tour. 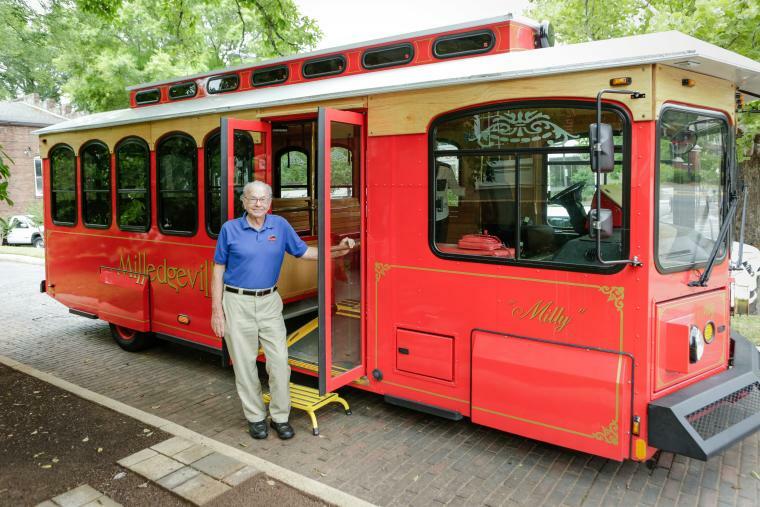 J.C. has been the smiling face behind ‘Milly’ the trolley since 1985. Having started as a fill-in driver all those years ago, the smiling faces of visitors and that shiny red paint got to his heart. He became a full time driver and never looked back. J.C. has met and cared for two different trolleys on behalf of the Milledgeville CVB over the years, including the current ‘Milly’. He has been with the CVB longer than anyone else and has shown countless tourists and locals the magnificent mansions, tree lined streets and bustling downtown. His love for visitors cannot be rivaled. J.C.’s last drive will be on June 15. After he retires, he will have more time to spend with his love for antique cars and motorcycles. While weekend trips to the mountains in his cars or on his motorcycles is surely in his future, of course we hope he will be here to be a fill-in trolley driver too.